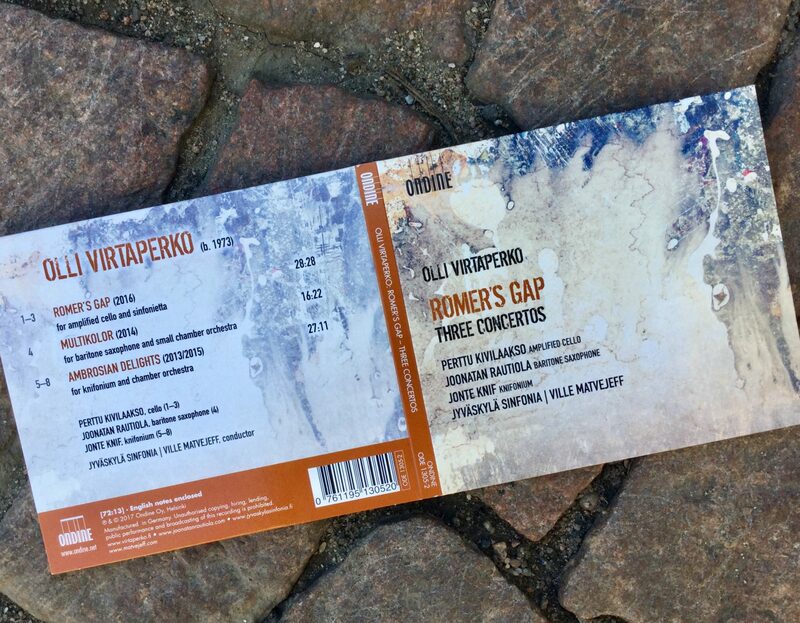 Romer’s Gap, a new CD release by Ondine includes three new concertos by Olli Virtaperko, recorded by the Jyväskylä Sinfonia under conductor Ville Matvejeff. Romer’s Gap is a concerto for electrically amplified cello featuring as soloist Perttu Kivilaakso, best known as lead cellist in the multi-million selling rock band Apocalyptica. Ambrosian Delights is a concerto for the knifonium, a vacuum-tube-based analogue synthesiser created and played by Jonte Knif. The baritone saxophone concerto Multikolor is written for Joonatan Rautiola and scored for a small chamber orchestra. Of the three concertos in the album Ambrosian Delights (2013) takes the most stylistic liberties. Originally written for a knifonium and Baroque orchestra, it gleefully mashes together elements from various eras and styles, from Baroque to spectral music and prog jazz. ”Ambrosian Delights required the most thorough and time-consuming research, as its writing progressed in tandem with the building of the prototype of the knifonium and my exploration of the mysteries of analogue synthesis, in which I was patiently tutored by Jonte Knif”, writes composer Olli Virtaperko. Multikolor (2014) is a single-movement work for baritone saxophone and small chamber orchestra. The concerto explores the exceptionally wide range of timbral possibilities of the solo instrument, such as various types of multiphonics. Multikolor is absolute music in the modernist vein, following only the dictates of its musical material and not referring to anything outside itself. The most recent of the concertos, Romer’s Gap (2016), may be regarded as a sibling to Ambrosian Delights with its electronic amplification and processing of the solo instrument. However, unlike the sprawling knifonium concerto, Romer’s Gap is more concise, more disciplined and more serious. The solo part in Romer’s Gap draws on the modern electric guitar tradition and Perttu Kivilaakso’s expressive potential yet does not take the mixing and matching of styles as an end in itself. CD release concert will be held in Tampere-talo, 10 November 2017 with Perttu Kivilaakso & Tampere Philharmonic Orchestra performing Romer’s Gap under Ville Matvejeff. * Recording locations – Romer’s Gap: Martti Talvela Hall at Concert Hall Mikaeli, Mikkeli, Finland, 21–22 November, 2016. Ambrosian Delights & Multikolor: Hannikaissali Hall at JAMK University Music Campus, Jyväskylä, Finland, 31 March–2 April, 2017.